Breeze is the leading wind energy software used globally by industry professionals to capture the true potential of their investments and optimize wind portfolio management. "Normally, I would recommend Breeze to every operational management company but then we would lose the advantage we have on the market at the moment"
- AXEL LEMBKE, HEAD OF WIND OPERATIONS, BayWa r.e. Breeze is the wind turbine management component of Energy Cloud. A cutting-edge specialized wind turbine software used by owners, operators and investors to monitor, manage, analyze, plan and predict every aspect of their wind farm portfolio. Monitor wind turbine production and alarms in real time. Analyze and compare operational and budget data. Schedule activities such as tasks, downtime, and maintenance. Create reports, CSV exports and share data through the API. Use Breeze on desktop, in control rooms and on mobile. Identify component failures in wind turbines before they occur. Breeze is a modern, user-friendly software solution that allows professionals to save time, improve turbine performance, and proactively manage wind portfolios. 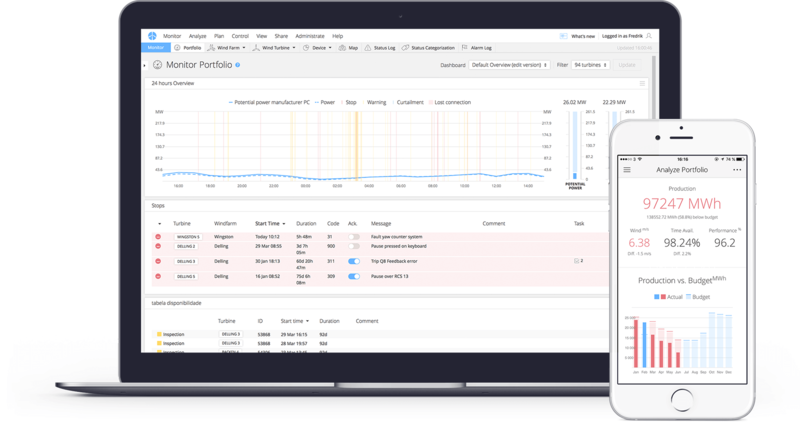 Compare actual production to targets, observe trends over time and track availability, performance metrics, lost production and your most important KPIs. Monitor large and diverse portfolios with ease. Receive notifications of critical events and track energy production, data connections, turbine statuses and custom alarms. Oversee all site activities, schedule O&M tasks and plan turbine downtime. Access task details, log comments and assign tasks to colleagues via automatic email updates.